Ivanhoe Cambridge and Greystar Real Estate Partners broke ground on 801 New Jersey Avenue, a new mixed-use development in Washington, D.C. that’s expected to be completed next summer. The LEED Silver complex will feature 227 apartment units and 5,774 square feet of retail space available for lease to boutiques and restaurants. Its range of studios, one- and two-bedroom floor plans vary in size from 537 to 1,357 square feet and will incorporate nine-foot ceilings, floor-to-ceiling windows, walk-in closets, full-size washers and dryers and balconies in most units. Modern interior finishes will include quartz countertops, custom cabinetry and plank flooring. Community amenities for tenants are a clubhouse with gathering and meeting spaces, fitness centre, executive work stations, a tree-lined rooftop terrace with a swimming pool, sundeck, indoor/outdoor bar area, grilling stations, fire pit, bike storage, a pet spa, 24-hour concierge, coffee station and underground parking. 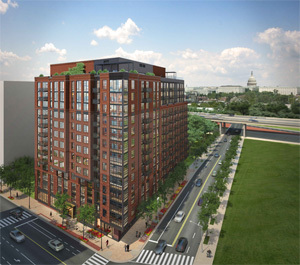 “Residents will enjoy spectacular views of the U.S. Capitol and great access to transit with the Navy Yard and Capitol South Metro Stations nearby,” Ezio Sicurella, senior vice-president of investments, residential, hotels and real estate investment funds for Ivanhoé Cambridge, said in a release. Montreal-based Ivanhoé Cambridge, the real estate subsidiary of the Caisse de dépôt et placement du Québec, joined a partnership comprised of Goldman, Sachs & Co., Greystar and other investors in a portfolio of 27 multi-residential properties across the United States in April 2013. Ivanhoé Cambridge and Greystar have since partnered on developing other mixed-use projects, including The Hudson project in Pasadena, Calif., and 2198 Market Street in San Francisco earlier this year. Greystar is headquartered in Charleston, S.C. and is the largest apartment operator in the U.S., managing approximately 385,000 units in more than 100 markets.